January Journal: Day 5 — Ginger writes. This photo is deceiving. In person you would notice the blue/green tint all over, not just the blue/green logo. To ensure that your new cheap cloth napkins remain cheap, do not wash them with whites. I repeat, do not wash them with whites. I was warned by the lady who wrote the blog post about using shop rags for napkins. She said to be sure to wash them with like colors the first time around because they may bleed. I took her advice and washed just the blue and green napkins together with similarly colored towels on their first washing. After that, it slipped my mind. TJ washed a random basket of laundry after Sailor had a potty accident recently, and neither of us thought to worry about the new napkins. 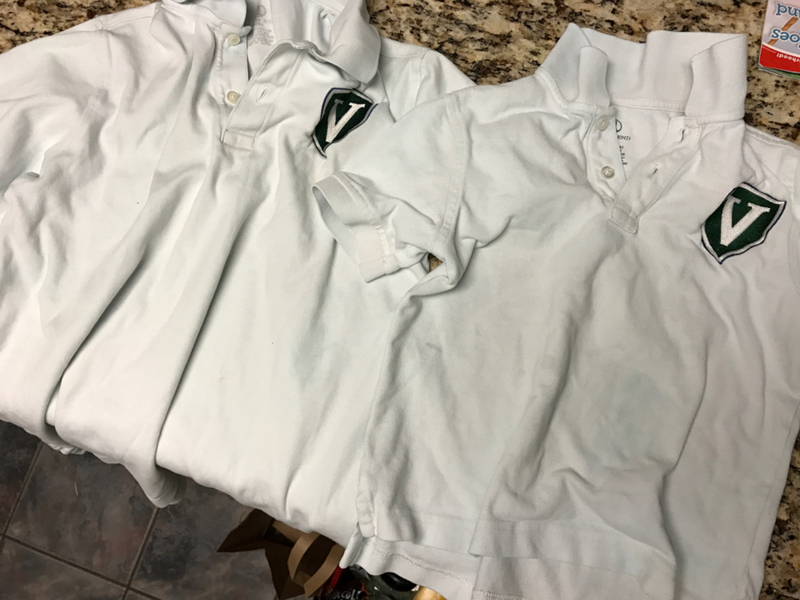 Unfortunately a couple of the kids' uniform shirts were mixed in that load. Last night while TJ and I were on a date, I got a text from Bauer saying that his school shirt was ruined, with blue and green streaks all over it. TJ's first response: "Well, I guess those napkins weren't so cheap after all." Story's school shirt was in there too. Sailor's little white t-shirt got tie-dyed, and my beige zip-up hoodie received minor markings. I was initially very bummed about the mishap, especially with their uniforms, and thankful Cash's shirt wasn't in there too. But thanks to a little bleach action, we are back in business. Yay - the cheap napkins remain cheap! I learned my lesson and will hopefully save you from learning the same lesson the hard way. So, if you buy shop rags for napkins, wash them with like colors, not just the first time, but for a while. I don't know how long the colors may keep fading. But thankfully, if you buy several sets like I did, you should have enough new napkins to save up a whole load of them to wash together. That's the plan anyway!